Mitch is an Australian swimmer who specializes in backstroke events. He currently swims with St Peter’s Western Swim Club, and represented Australia at both the 2012 and 2016 Summer Olympic Games. Most recently, Mitch competed in the 2018 Commonwealth Games, allowing us an opportunity to do a deep analysis of his impressive performance. 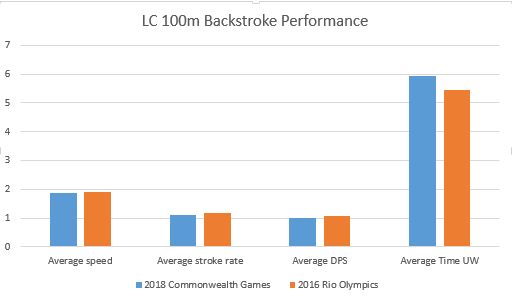 We compared his 100 m backstroke from this competition to the 2016 Rio Olympics to see how his performance changed over time. Since earning his first Short Course World Championship medal in 2014, Mitch has raked in over a dozen international medals: 4 gold medals, 6 silver, and 3 bronze. After his performance at the 2018 Commonwealth Games, we can add 5 more gold medals to his list of accomplishments, as he won every final he took part in. Larkin secured the full sweep in the backstroke events – the first man in games history to do so. Comparing Mitch’s performances in 2016 and 2018, we see a slight drop in his DPS. Mitch also generally swims with a shorter DPS compared to his competitors in order to increase stroke rate. The drop in Mitch's DPS was accompanied by a small increase in his stroke rate. Mitch averaged a stroke rate which was 12% faster than the 2nd and 3rd place competitors in 2018. Short DPS + fast stroke rate = a lethal combo for Mitch. With the strategic combination of Mitch Larkin’s shorter DPS and faster Stroke Rate, he found a great balance to perform at a high speed. At the 2018 Commonwealth Games, Mitch had an average speed of 1.88m/s while hitting a top speed of 1.93m/s. Although the change in Mitch’s speed lap to lap was close to his competitors' (Change in speed: Mitch = 0.10m/s, Competitors = ~ 0.12m/s) no one kept up with his pace (Competitors average = 1.84m/s), giving Mitch the overall advantage. Mitch increased his time underwater in 2018, tallying up the longest time spent underwater (11.9s) in his heat. More importantly, he had the most consistent time underwater for both laps (5.95s / 5.93s), a clear demonstration of skill. While the Olympics is a higher calibre competition and results in faster swims - Mitch's 52.43 placed him 4th in Rio and his 53.18 won him gold at the Commonwealth Games - he employed the same strategy in both competitions, knowing that increasing his stroke rate instead of forcing longer strokes works better for him. Mitch’s coach states “We really do not tend to change too much. A little more focus on starts, turns and underwater kicks in conjunction with a good balance of conditioning work and speed work.” Work on what needs to be worked on. Mitch Larkin had a less than stellar performance at the 2017 FINA World Championships, and he revealed that this fuelled him to become Australia’s most successful swimmer at the Commonwealth Games. He did exactly that, raking in 5 gold medals and sweeping all backstroke events at the 2018 Commonwealth Games.